FORT RILEY, Kan. -- Sgt. Maj. Tamara J. Gregory, senior enlisted advisor for the Office of the Assistant Secretary of the Army, Manpower and Reserve Affairs, visited Fort Riley Oct. 4 at Barlow Theater to provide an information brief to female Soldiers, noncommissioned officers and officers on women transferring to Combat Arms military occupational specialties. Gregory said there are about 166 women who have joined the service across the United States to serve in Combat Arms jobs, but those young women need leadership. There has been an insufficient number of female Soldiers and NCOs transferring into these leadership roles. 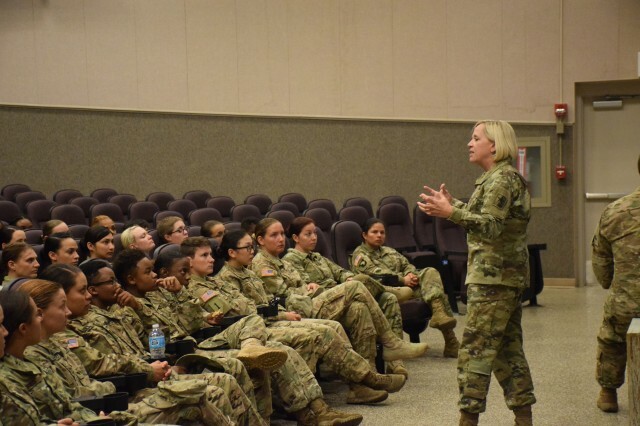 "These young females that are coming into the Army, could someday be the Sergeant Major of the Army," she said. "That's why we need young women like you to motivate them, to mentor them, to provide the motivation (to) keep them in, to show them what is right and wrong about what they are learning about the Army." Gregory said there are four companies they are trying to fill with one officer and two NCOs. They have had officers come forward, but are still looking to the NCOs to fill the spots. 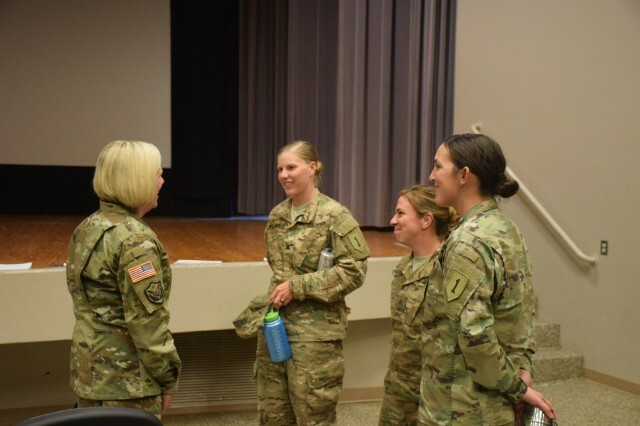 "The intent of the Army is to have one captain and two NCOs per company," she said. Gregory said women have an option to declare a secondary MOS before switching their primary MOS to a Combat Arms role. This allows women to be sure of their decision to switch over to a Combat Arms MOS. Female Soldiers with a secondary MOS would be in the role for 24 to 36 months. Gregory said women stepping up to change their MOS's would be among the first in their field. Spc. Bernadette Lezar, 82nd Engineer Battalion, 2nd Armored Brigade Combat Team, 1st Infantry Division, was one of the hundreds of Soldiers who attended the brief. "I had no intentions of ever doing anything like this, but Sgt. Maj. Gregory made it sound really enticing," she said. Lezar said the presentation made her reconsider what she initially thought about changing her MOS to a Combat Arms role. The real eye-opener for her was the occupational physical assessment test, which helps determine physical qualifications for Soldiers to be allowed to serve in a Combat Arms MOS. "I'm looking at these stats and I know I could do all of those easily," Lezar said. "In the past I've thought the combat MOS is not for me, and then I look at that and think I can do it easily." In December 2015, Defense Secretary Ash Carter announced all military occupations would be open to women in January 2016, according to an article published on Army.mil on Dec. 3. As long as they meet specific standards, women could serve their country with no barriers for the first time in U.S. history. "They'll be allowed to drive tanks, fire mortars and lead infantry Soldiers into combat," Carter said in the article. "They'll be able to serve as Army Rangers and Green Berets, Navy SEALs, Marine Corps infantry, airborne parajumpers, and everything else that was previously open only to men." For female Soldiers who are interested in switching their MOS, contact your unit Retention NCO for more information. "To do this, is you -- stepping forward and making history," Gregory said.